Join the best tattoo artists in Hot Ink, our tattoo parlor from Microgaming. We all know that tattoos are cool and this game will show us exactly that. No matter if you are a fan of body drawings or not, you will be a fan of this game once you try it out. Join Luci the Gothic brunette and Angel and have some fun. Hot Ink is powered with 3 special symbols each having a different role in the game. The tattoo bonus symbol, the fish tattoo and the game’s logo. Let’s start with the Tattoo bonus which is activated every time you land 3, 4 or 5 scatter symbols. Now you need to play a mini game where you have to find matching tattoos. If you do, you will receive 10 free spins if not you will still get some cash prizes. 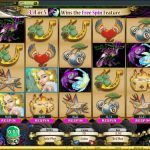 There is another way to activate the free spins and that is with the Koi fish symbol. 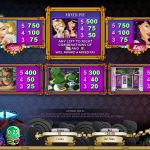 You get 20 free spins with doubled wins and option to reactivate the feature one more time. When it comes to special features we have to mention the Re-spin Feature. After each spin you have a chance to re-spin any reel for a given cost. 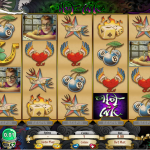 Hot Ink is a really nice game and Microgaming did a perfect job when they came up with this exact slot. The theme is something we do not see every day and straightforward game that always keep you in anticipation. The good thing here is that the main feature can be activated on a regular basis. Great addition to the game is the respin feature which allows you to make another spin if you are not happy with the outcome. If you want to get into the spirit of Christmas then consider playing Ho Ho Ho a 5 reel slot by MicroGaming.